Axle tag number location on build sheet. What's the right tag for your car? Check your build sheet for the right axle code for your car. 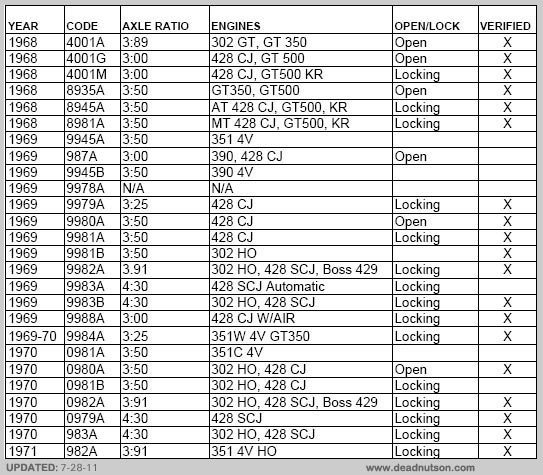 If you don't have your build sheet, we have made up an axle tag application chart our supplier acquired from Ford, but it doesn't specify any difference between open and locking axles, except for the ones we have verified. Note: In our experience, the metal axle tag code didn’t match or only partially matched build sheet code because the paper axle tag specified the complete rear axle assembly and the metal tag only specified the third member components. Q: Were do you install the paper axle tag? A: Install axle tag right next too or underneath the drivers side inside u-bolt (see pictures of survivor tags). Q: If my housing flange yellow paint marking is on the passenger side and not the drivers side of the housing what side does the tag go on?